Go forth, o bhikkhus ! Re: Go forth, o bhikkhus ! everyone complains about religious sectarionism then when we find something we all have in common like metta. we say oh dont teach that THATS buddhist. i think we can learn a lot from eachothers religions. buddhists could maybe learn how to pratice more community charity. like the christians do. and christians could learn how to do metta meditation. no much of a stretch. its not blending its just amplifying things in each religion. chownah wrote: Seems that what you describe as converting in buddhism is the exact same thing as converting in christian missionary work.....even the mind set that it is the "greatest good one can do" is the same. Is the idea of "converting one from adhamma to dhamma" found in any scripture....I'm sort of wondering about the term "adhamma" as to whether it exists at all in the scriptures and if so was it used in the way you are describing as "converting" people. Not really....in Buddhism, it is not so important what the "converts" call themselves or who they venerate; it is more important that they benefit from the Dhamma. "Bhikkhus, the bhikkhus who explain the incorrect teaching (adhamma) as incorrect, do it for the benefit and welfare of the many who entered upon the path, for the benefit , welfare, and happiness of devas and human. They accumulate much merit and perpetuate the true dhamma ( saddhamma). "Bhikkhus, the bhikkhus who explain the correct teaching (dhamma) as correct, do it for the benefit and welfare of the many who entered upon the path, for the benefit , welfare, and happiness of devas and human. They accumulate much merit and perpetuate the true dhamma ( saddhamma). Thanks for giving the reference using the term "adhamma". Doesn't it seem like if you "explain the incorrect teaching" and if you "explain the correct teaching" then really what you are doing is teaching the dhamma? You could be doing this to someone who has already taken refuge in the triple gem and so you would not be "converting" them as they would already be Buddhist....so even if someone is not a Buddhist there seems to be no reason to fabricate some idea of "converting" when really all one is doing is "teaching". So now I've come full circle....I started thinking that this thread was about teaching the dhamma...then I accepted that I was wrong and that really it was about "converting" people....and now it seems that we are back to teaching the dhamma. Also, it really does seem to me that "converting people" really is indulging in a doctrine of self....isn't it better to just hope that when the dhamma is taught that insight arises? chownah wrote: Thanks for giving the reference using the term "adhamma". Doesn't it seem like if you "explain the incorrect teaching" and if you "explain the correct teaching" then really what you are doing is teaching the dhamma? You could be doing this to someone who has already taken refuge in the triple gem and so you would not be "converting" them as they would already be Buddhist....so even if someone is not a Buddhist there seems to be no reason to fabricate some idea of "converting" when really all one is doing is "teaching". So now I've come full circle....I started thinking that this thread was about teaching the dhamma...then I accepted that I was wrong and that really it was about "converting" people....and now it seems that we are back to teaching the dhamma. Also, it really does seem to me that "converting people" really is indulging in a doctrine of self....isn't it better to just hope that when the dhamma is taught that insight arises? The quotation used in the first post in this thread didn't really consider if one should be called a Buddhist or not. It was just a call to spread or if you prefer to teach the Dhamma. 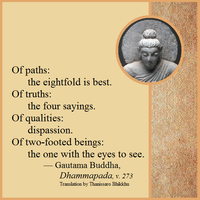 From the quote it seems obvious that the Buddha intended his teachings to be carried far and wide ( and not only to correct misunderstandings of those who have taken refuge). There was no question of converting. The whole idea of coverting people from one team to another seems more to be a concept which originated from theJudeo-Christian tradition. In the temple I go to, no one ever asks if one is a Buddhist or has taken refuge. Bhikkhu Pesala wrote: My own forums have very few visitors — while I am somewhat reluctant to post on Dhamma Wheel because so many come here just to argue, not to learn the Dhamma at all. It is the same on most Buddhist forums. Supporting a teacher or sangha through service, donations, and advertisement (fliers). Organize an event if there are none locally. When asked, answering questions to the best of one's ability, adding clear qualifiers when uncertainty arises. What are the credentials for teaching? Can a lay follower teach a few basic concepts and basic meditation techniques if they feel comfortable and confident?